Many hot tubs out there claim to be “portable”, from the Coleman Lay-Z-Spa on through to the Homax and Intex lines of inflatable hot tubs. Even some hardshell spas like the SpaBerry 2-person model claim portability despite the reality that they have shipping weights of hundreds of pounds. Yeah, super portable, guys, really. No. Not something we’d try hauling along on a camping trip, not a chance, no thank you. Portability to us really means the ability to unplug and typically the ability for one individual to carry the item easily (although we’ve been known to make exceptions to that before). None of these unplug, however. In every case, you’ll need an outlet from a nearby structure, generator, or other portable power source, increasing your load. 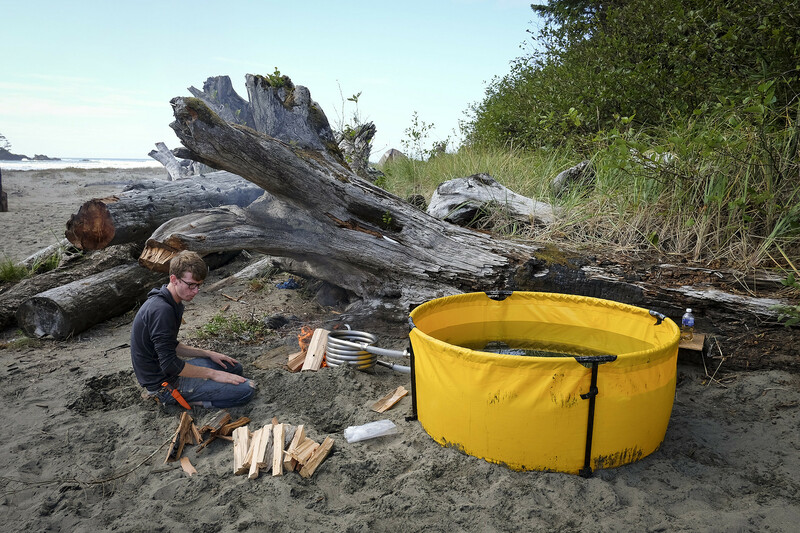 Something that does appear very portable and that we might consider hauling on a camping trip on the other hand is the 225-gallon vinyl Original Nomad Collapsible Tub, which packs down into a 20lb. 15″x15″ cube (including the frame) and can be carried in a duffel bag. It’s true, the tub is not the only thing you’ll need if you want to actually heat up the water you put inside it, you know, for that actual jacuzzi experience. For that, you’ll want to consider picking up the coil they sell to go along with the tub structure itself. Not to fear, the stainless steel, thermosyphoning (meaning no water pump needed) coil that they sell with it is also extremely portable, coming in at just 8″x14″ (14″x14″ with the feet). The complete setup fits into a 14″ x 16″ 30″ duffel bag. And talk about unplugging. No electricity required – the coil runs off natural gas, propane, or firewood. Yes, that’s right, firewood. So while you’re all going to be gathered around the campfire anyway, might as well be simultaneously heating up your hot tub, ya ballah, you, especially as it could take up to 3.5 hours to get to desired temperature depending on the outside air temp. Shiiiyaaaaat. 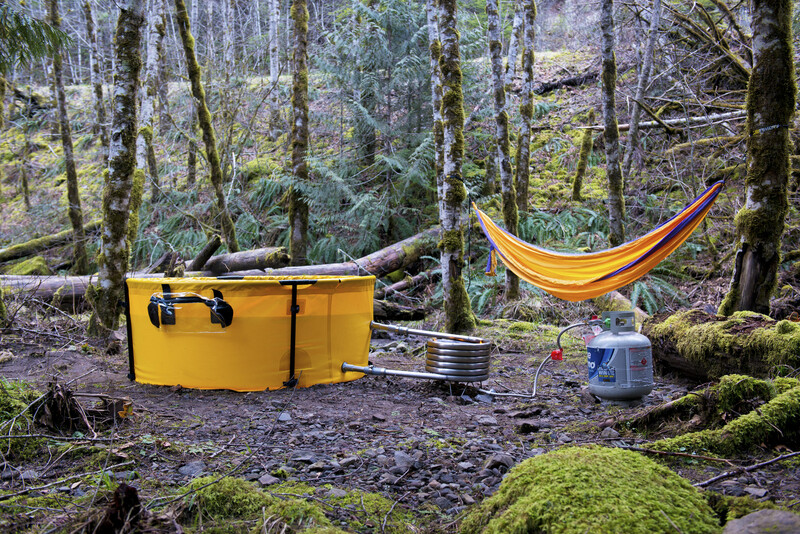 If you and your crew are planning on taking the tub to a particularly remote area where your campsite will just be whatever you can find on the side of a lake or river, no KOA, RV, or house plumbing to feed off, the Original Nomad company based out of Portland recommends the Honda WX10 fuel-powered portable water pump to fill your 5-peeps jacuzzi from whatever body of water you’re next to. And for all you “leave no trace” folks, when you’re done, you can pump the water right back into where it came from. Wuuurd.